It is easy to eat more than we think we are eating. What satisfies one person may be too much or too little for someone else. 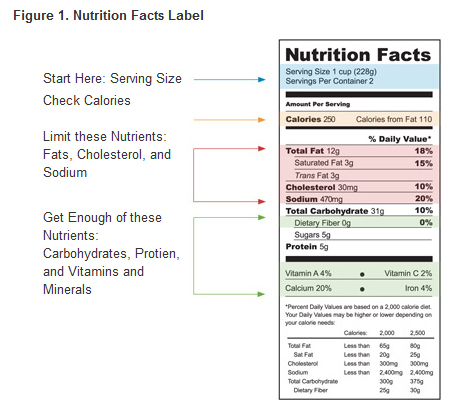 To help consumers know what and how much of something they are eating, the U.S. Food and Drug Administration (FDA) requires a Nutrition Facts label on most packaged foods (see Figure 1 ). A food label tells you how many calories and servings are in a box or can. The serving size varies from product to product and even among brands, and can be tricky because labels can change from time to time. If you need to watch your calories, fat, carbs, or any particular nutrient, be sure the check the label with each new food item. If there is no label, you can use online tools such as Calorie King to help you calculate your nutrients. A portion is how much food you choose to eat at one time, whether in a restaurant, from a package, or at home. A serving is the quantity of a food for which the label contains nutritional information. Sometimes the serving size and portion size match; sometimes they do not.